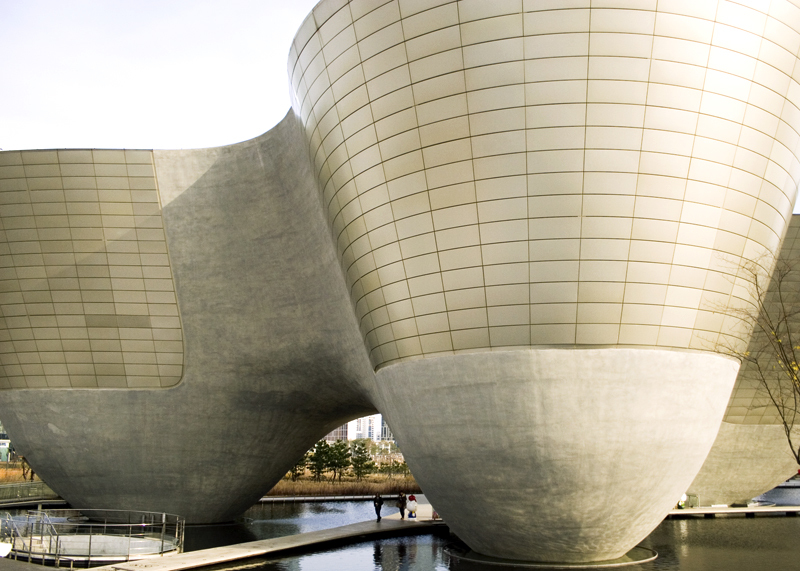 The Songdo neighborhood of Incheon is curious mix of urban design and the American Wild West. Despite the futuristic blueprints of the high rise apartments, the wide and vacant streets felt as spacious as an open plain. It was the first time since leaving home that I had felt a sense of déjà vu. 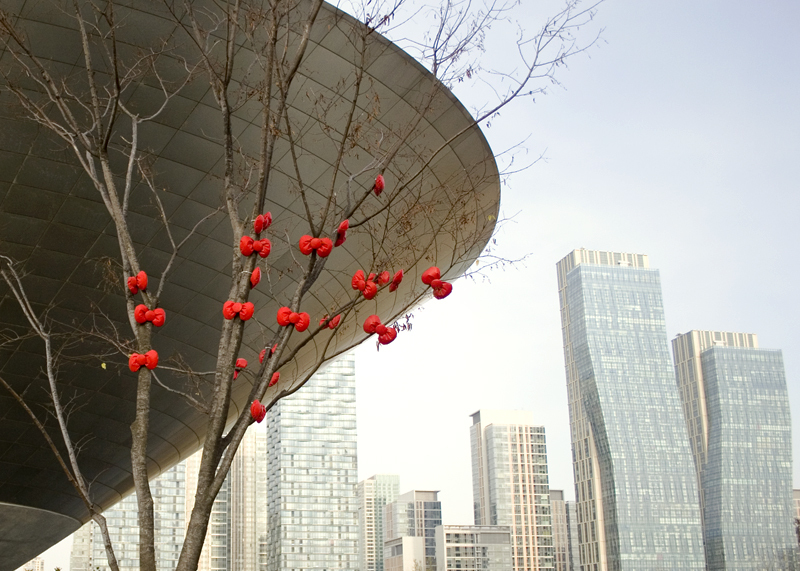 I was lost in the reverie of a familiar landscape when the Incheon City Tour bus passed the Tri-Bowl. The Tri-Bowl was an enormous aluminum molar hovering insubstantially above a reflection pond. It was an overcast day and the only splash of color came from small red bows dotting naked tree branches. I excitedly wiped the moisture off the foggy windows for a better look and vowed to return to this otherworldly structure. The following weekend my two female coworkers and I coerced my boyfriend to visit the Tri-Bowl to see “Hello Kitty Planet.” For Barret it certainly seemed like an extraterrestrial environment populated by cotton and polyester beings. 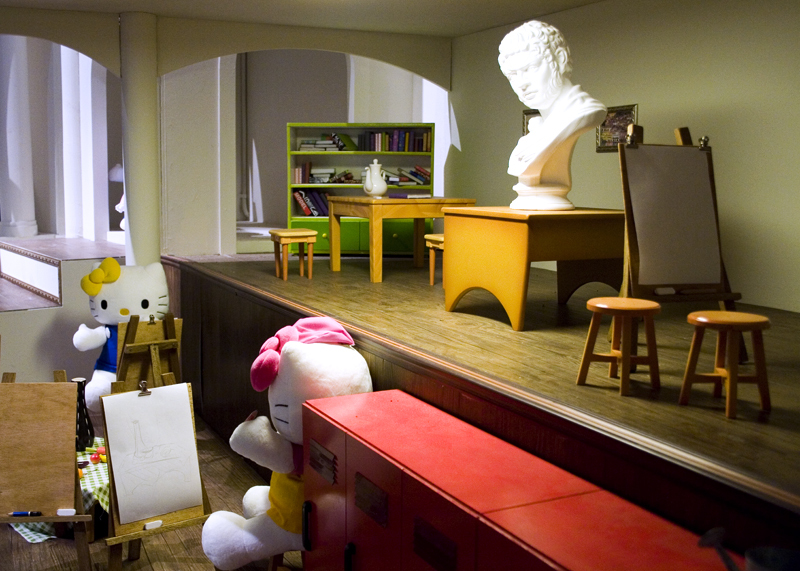 While us girls admired Hello Kitty’s extended family, he was aimlessly adrift amongst the dioramas: Hello Kitty the apt art student, the cowgirl galloping across the open plains, the rock star with miniature bottles of whisky. As we wound our way through the decades of paraphernalia, we kept a lookout for an extravagantly over-sized plush Hello Kitty. My coworker had found an image in the local newspaper and it was a big reason why we made the trek to Incheon on such a cold day. However, as we passed the final exhibit (a tight pink coil of poop with a tidy yellow bow), the fabled toy was no where in sight. We soon realized Giant Hello Kitty was on hospital leave. Oh cruel world! Ms. Kitty just doesn’t look the same when she is sick. At Gangnam Station Exit #7 catch bus M6405. Exit at Central Park Station. Or take the subway to the Incheon Line 1, Central Park Station Exit #4. 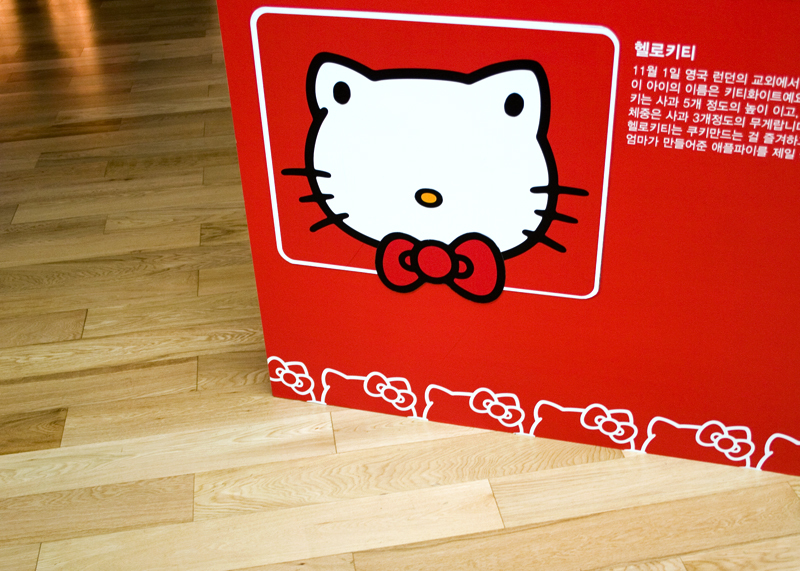 Hello Kitty Planet: On display till the June 30th, 2012 (Open Tuesday-Sunday 10-6pm) Cost- 12,000 won. Which method is easier ?